Coal is a valuable and plentiful natural resource. Worldwide, coal accounts for 41% of all power generation and this is increasing year on year partly due to the rapid growth of the developing economies in India and China. Not only does coal provide electricity and domestic heating, it is also an essential fuel for steel and cement production, and other industrial activities worldwide. Coal is a combustible, sedimentary, organic rock, which is composed mainly of carbon, hydrogen and oxygen. It is formed from vegetation, which has been consolidated between other rock strata and altered by the combined effects of pressure and heat over millions of years to form coal seams. Coal is the most abundant fossil fuel and is far more plentiful than both oil and gas which are both thought to be already at or near peak production. It has been estimated that there are over 847 billion tonnes of proven coal reserves worldwide. This means that there is enough coal to last us for around 118 years at current rates of production. As oil and gas reserves dwindle or become unobtainable due to the political instability typical of oil and gas producing countries, coal will doubtless become even more important to the developed world. Coal is the altered remains of vegetation that originally accumulated in prehistoric swamps and peat bogs. The energy we get from coal today comes from the energy that plants absorbed from the sun millions of years ago. All living plants store solar energy through a process known as photosynthesis. When plants die, this energy is usually released as the plants decay. Under conditions favourable to coal formation, the decaying process is interrupted, preventing the release of the stored solar energy. The energy is locked into the coal. Coal formation began during the Carboniferous Period – known as the first coal age – which spanned 360 million to 290 million years ago. The build-up of silt and other sediments, together with movements in the earth’s crust – known as tectonic movements – buried swamps and peat bogs, often to great depths. With burial, the organic plant material was subjected to high temperatures and pressures. This caused physical and chemical changes in the vegetation, transforming it into peat and eventually into coal. The degree of change undergone by a coal as it matures from peat to anthracite is known as coalification. Coalification has an important bearing on coal’s physical and chemical properties and is referred to as the ‘rank’ of the coal. Ranking is determined by the degree of transformation of the original plant material to carbon. The classifications of coals, from those with the least carbon to those with the most carbon, are lignite, sub-bituminous, bituminous and anthracite. Initially the peat is converted into lignite or ‘brown coal’ – these are coal-types with low organic maturity. In comparison to other coals, lignite is quite soft and its colour can range from dark black to various shades of brown. Over many more millions of years, the continuing effects of temperature and pressure produces further change in the lignite, progressively increasing its organic maturity and transforming it into the range known as ‘sub-bituminous’ coals. Further chemical and physical changes occur until these coals became harder and blacker, forming the ‘bituminous’ or ‘hard coals’. Under the right conditions, the progressive increase in the organic maturity can continue, finally forming anthracite. In addition to carbon, coals contain hydrogen, oxygen, nitrogen, ash and varying amounts of sulphur. High-rank coals are high in carbon and therefore heat value but low in hydrogen and oxygen. Low-rank coals are low in carbon but high in hydrogen and oxygen content. The choice of mining method is largely determined by the geology of the coal deposit. Underground mining currently accounts for a bigger share of world coal production than opencast; although in several important coal producing countries surface mining is more common. For example, surface mining accounts for around 80% of production in Australia; while in the USA it is used for about 67% of production. Surface mining – also known as opencast – is only economic when the coal seam is near the surface. This method recovers a higher proportion of the coal deposit than underground mining as the whole coal seam is exploited – 90% or more of the coal can be recovered. The overburden of soil and rock is first broken up by explosives; it is then removed by draglines or by shovel and truck and stored. Once the coal seam is exposed, it is drilled, fractured and systematically mined in strips. The coal is then loaded on to large trucks or conveyors for transport to either the coal preparation plant or direct to where it will be used. Once mining has finished, the overburden is replaced. 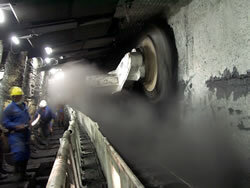 Longwall mining involves the full extraction of coal from a section or “panel” of the seam using mechanical shearers. A longwall face requires careful planning to ensure favourable geology exists throughout the section before development work begins. The coal ‘face’ can vary in length from 100-350m. Self-advancing, hydraulically-powered supports temporarily hold up the roof while coal is extracted, creating a safe area for the miners to work in. As the coal face advances, the roof behind is allowed to collapse. Over 75% of the coal in the deposit can be extracted from panels of coal that can extend 3km or more through the coal seam. Technological advancements have made coal mining today more productive than it has ever been. To keep up with technology and to extract coal as efficiently as possible modern mining personnel must be highly skilled and well-trained in the use of complex, state-of-the-art instruments and equipment. Coal mining in the British Isles has been going on since Roman times and has played an essential role in our history and the creation of the modern world. Coal fuelled the British industrial revolution during the nineteenth century and around 22 billion tonnes have been used in Britain since 1853. Output peaked during 1913 at an incredible 300 million tonnes. The consumption of railway locomotives alone was around 12 million tonnes per year during the 1930s. Originally all British coal was from deep mines but surface mining began in the 1940s, initially as an emergency measure during the Second World War to increase national production. Output from surface mines peaked at 21million tonnes in 1991. In 1947, national output was still 200 million tonnes and there were 958 pits in operation. Output did not drop much below this level until 1960. By 1965 output had dropped to 187 million tonnes but productivity was higher as this was obtained from only 483 pits. 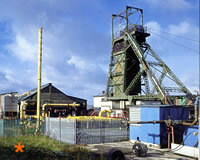 Output in 2010 was 18.4 million tonnes when there were 17 pits operating and around 40 opencast sites. Economically recoverable coal reserves for existing deep mines and opencast sites in Britain are estimated to be around 400 million tonnes. However, the total potential British coal reserves are much larger. 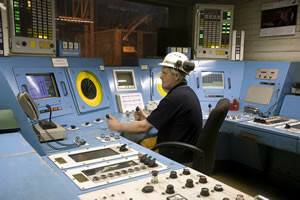 The Coal Authority, the body responsible for directing the British coal industry, has indicated that in 2005 coal resources at existing deep mines and existing, planned and known potential surface-mining sites were in the order of 900 million tonnes, with approximately one-third in deep mines and two-thirds at surface-mining sites. Additional recoverable tonnages considered to be potentially available from new or expanded deep-mining operations amounted to almost 1.4 billion tonnes!! Unlike gas and oil which are now mainly imported (Government consultants forecast that up to 90% of our gas requirements will need to be imported by 2020), coal is still a plentiful indigenous resource. 35 per cent of UK power is generated by coal fired power stations. However during the periods of peak demand, coal stations can be ramped up to provide 47 per cent of Britain’s power compared to gas stations at around 34 per cent and nuclear stations at around 19 per cent. Coal is the only fuel that can be relied upon to match these periodic sudden increases in demand so is absolutely vital for Britain’s energy future. Renewables, including wind and hydro power, collectively produce less than 1 per cent of national peak-time needs!! 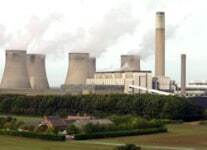 Ratcliffe-on–Soar power station in Nottinghamshire (pictured on right) is capable of generating 2,000 MW which can supply the energy needs of 2 million people. Coal arriving at the power station is first milled to a fine powder, which increases the surface area and allows it to burn more quickly. The pulverised coal is blown into the combustion chamber of a boiler where it is burnt at high temperature. The hot gases and heat energy produced convert water in tubes lining the boiler into steam. The high pressure steam is passed into a turbine containing thousands of propeller-like blades. The steam pushes these blades causing the turbine shaft to rotate at high speed. A generator is mounted at one end of the turbine shaft and consists of carefully wound wire coils. Electricity is generated when these are rapidly rotated in a strong magnetic field. After passing through the turbine, the steam is condensed and returned to the boiler to be heated once again. The water used for this cooling is recycled within the cooling towers and re-used. This means that relatively little fresh water is actually required – Only around 5% make-up water per hour is added to the circulating water. It also means that no hot water is discharged into the environment. The electricity generated at around 22,000 volts is transformed to the higher voltages (up to 400,000 volts) for economic, efficient transmission via the national grid. When it nears the point of consumption, the electricity is stepped down at a local sub-station then finally before it enters the home, it is transformed down to 240V. Sadly, by 2016 the last remaining deep mine was closed as a consequence of Government pressure to remove coal-fired electricity generation from the UK fuel mix. Remaining coal-fired generation will rely upon imported coal. Prior to privatization, British Coal commissioned a History of the British Coal Industry in five volumes, up to 1982. These were published by Oxford University Press. The final volume covers nationalization, 1946 to 1982. Website: www.scottishminingmuseum.com – Tel: 0131 663 7519. Bliss Hill, Ironbridge Gorge Museum, Telford, Shropshire – Website www.ironbridge.org.uk – Tel: 01952 586063. County record offices will hold various archives in coal mining or former coal mining areas. Several universities hold archives relating to coal and mining. Details of these are best sourced from bibliographies etc in academic texts. Specific archives are held by the following but are generally of limited access. Please contact prior to any visit. Society of Coal Merchants – written archives of the retail coal trade based in London and home counties (1600s to present day). Coal Merchants Federation (GB) Ltd – Limited access to archives of proceedings of the Federation and other associated bodies. Coal Authority – various archives relating to NCB and British Coal. Tel: 01623 427163.